Happy Thanksgiving! Here in Canada it is a long weekend because today, Monday, is our Thanksgiving. Although not as big a holiday as is the American Thanksgiving in November--our favourite and biggest is Christmas-- we do still celebrate a time with family, good food, and giving thanks for so many many things. 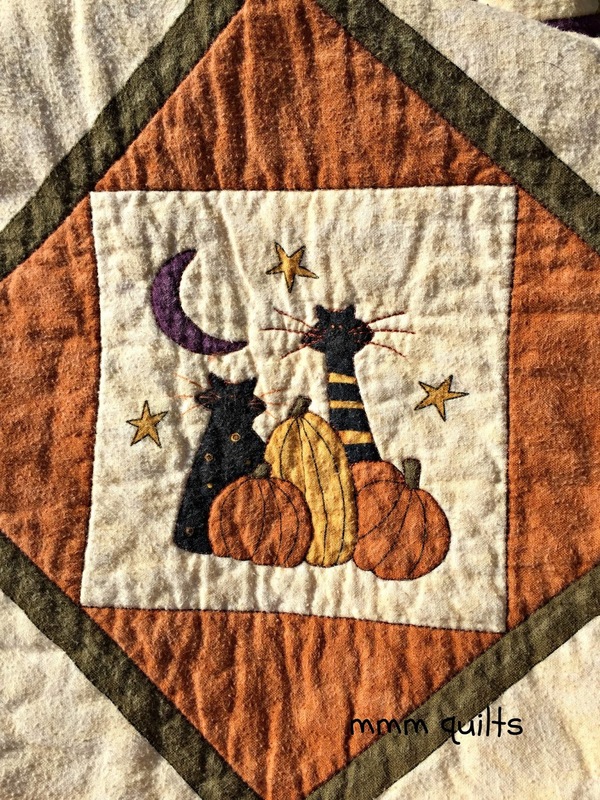 I had another post all ready to go but then thought this quilt, a blast from the past, would be more appropriate for today. This was a quilt on display in my former LQS, Lori's Country Cottage, in Sherwood Park, Alberta. Lori's was one of the Top Ten shops in Quilt Sampler, Spring 2012. The centre is a panel, and I believe they gave you a pattern sheet with instructions to complete the checkerboard and piano keys frame. I remember collecting fat quarters and quarter metre cuts of various flannels in several local shops in and around the Edmonton area. I made the quilt in 2005. 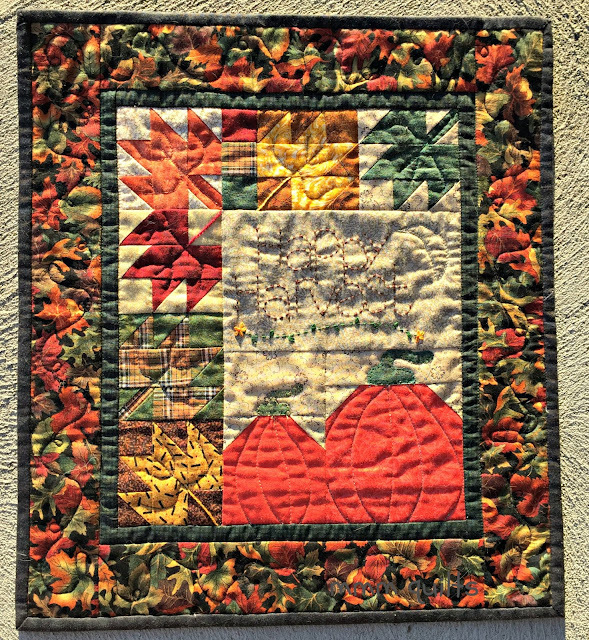 I FMQ-ed around the motifs and the frames in the panel, and then did ribbon-like swoops à la Kathy Sandbach, pumpkins and leaves in the piano keys. I was known in my guild at the time for interesting backs, whether they were pieced with leftovers as was this one, and/or with interesting and as good a quality of fabric as on the top. I still love to do both; I always check out the sales section in a quilt shop for potential backings. I will buy 3-5 yards/metres depending on potential and price, no matter if I have a quilt in the works that needs a backing or not. 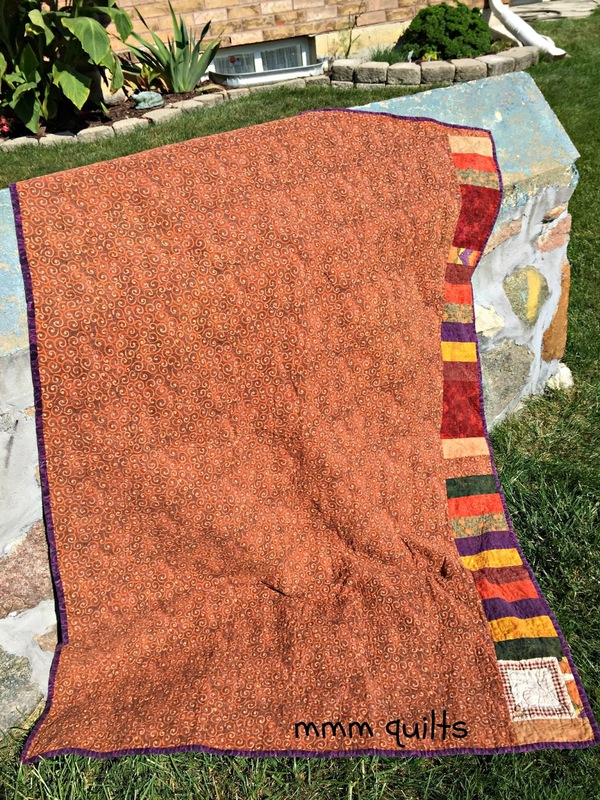 This was the first quilt that was 100% flannel front and back. It is so cuddly! I pieced the label as an integral part of the backing. 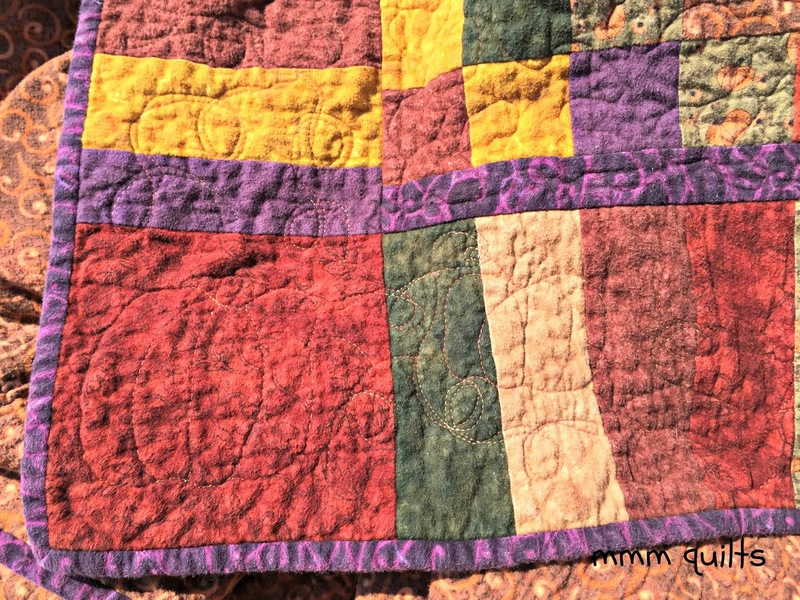 I absolutely am in love to this day with the rich colours in this quilt. You can see how well it has laundered, albeit pilled (flannel will do that). It is on the couch each Fall for both Thanksgiving and for Fall. Sadly, I did not record the designer information. I do know that some of the flannels are Debbie Mumm, others are Nancy Halvorsen. The quilt measures 43.75" X 61.5", a good cuddle size. 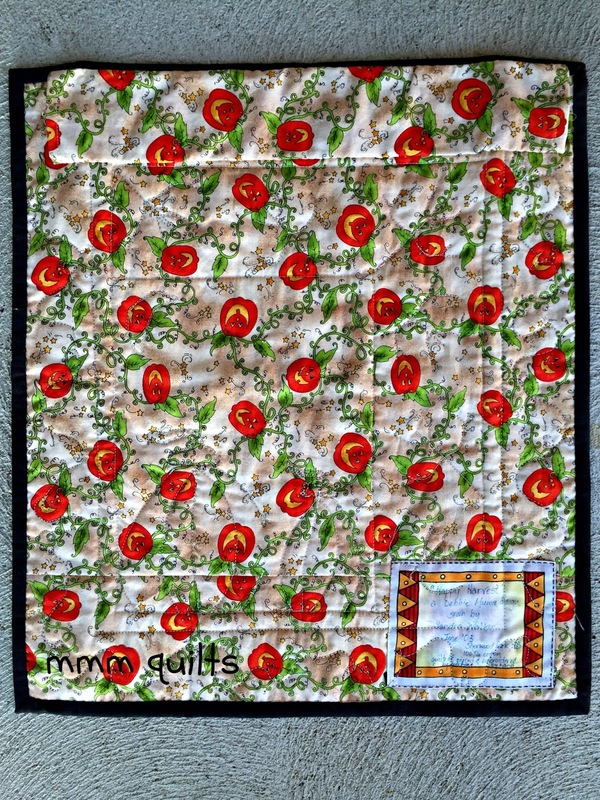 Speaking of Debbie Mumm, here is a little quilt made in 2003 from a pattern in one of her books. It is hanging at my front door. I thought I'd include it today. I was into the Sulky rayons and metallics back then (still love 'em). The leaf blocks finish at 3"! The quilt took longer than I anticipated for being so small, just 15.5 X 17.25". Hmm, had some tension issues with my FMQ then too! Maybe it's not all Avril's fault! (I know it isn't) I was taught that it's better to have your top thread pull slightly towards the back however, but areas of this are not so good...think my hands and foot speed were not in sync always by the looks of the sizes of the stitches. I wish all my Canadian friends, family and followers a peaceful and happiness-full Thanksgiving, and for my international friends, the same wish for the first day of another week in October! Now I'm off into yet another glorious Fall day here in southwestern Ontario to walk Rocco. Above the sumac trees in the photo below, is, I believe, a huge Silver Maple. I just love how these trees turn: it looks like Mother Nature has dipped their tips into orange icing! I hope that you have a wonderful Thanksgiving day! I can't help but think this post and quilt would also be perfect for a Throwback Thursday link party. :) Interesting to be able to look back and see things like the tension adjustment on these quilts. Do you think it will inform you of any changes to make now? 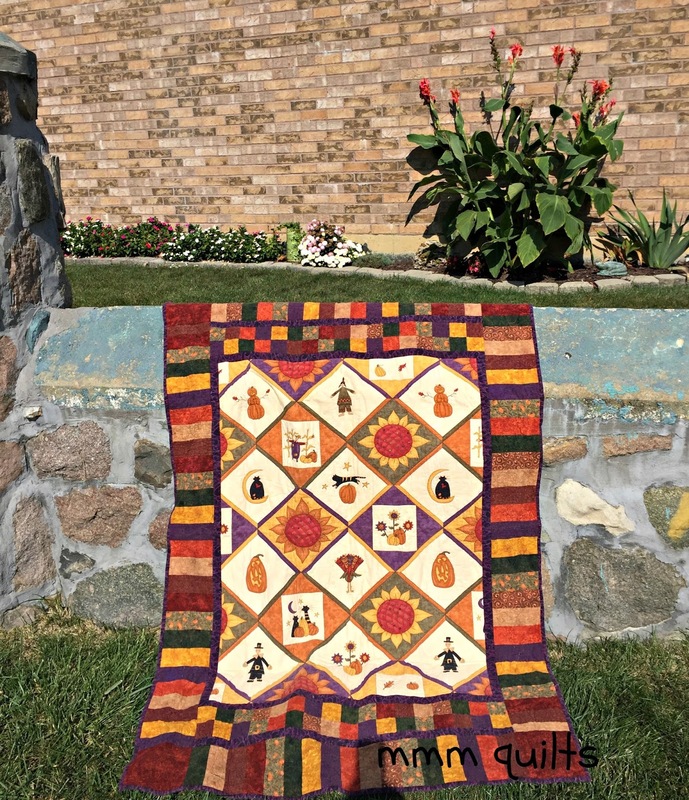 Love all these quilts and the fall colours you've used. Just beautiful! Happy thanksgiving to you too, all of us siblings and Mum were together yesterday, mainly for D's birthday, but thanksgiving nonetheless! Happy Thanksgiving Day! What a fun post to celebrate. Fall quilts are some of my favorites, and your flannel one looks so cozy. Happy Thanksgiving Sandra. 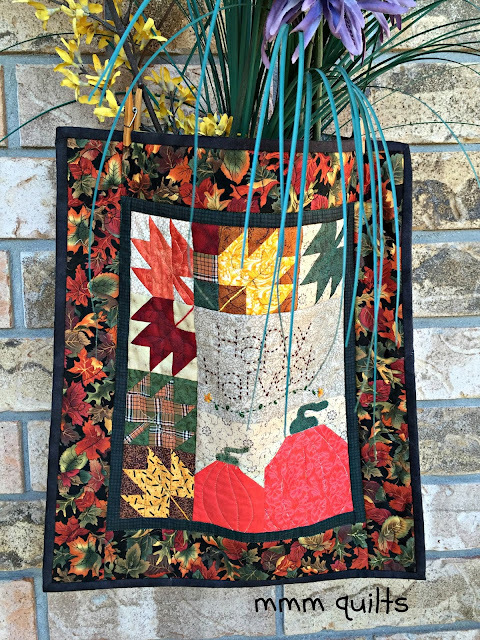 I love the colors of fall - in the landscape and the fall quilts. Happy Thanksgiving, Sandra! 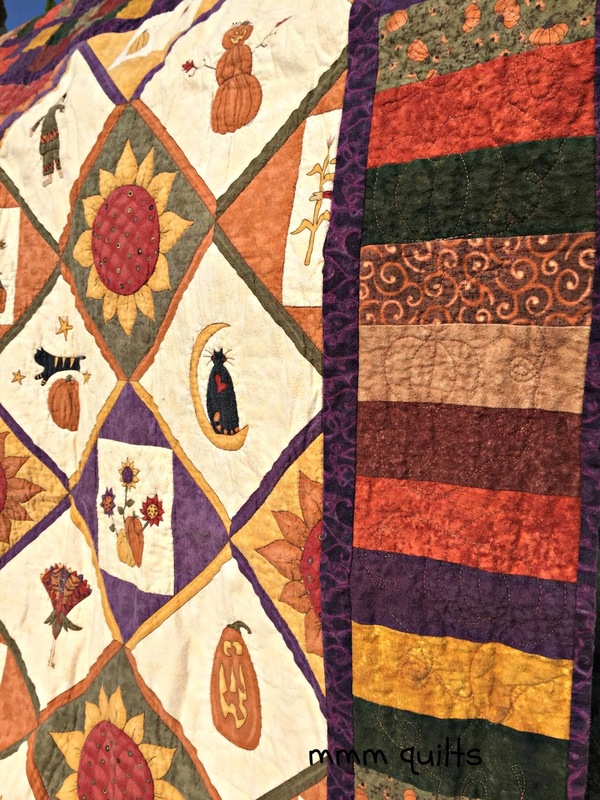 I loved seeing these quilts. I have a lot more spring quilts than fall quilts. These are inspiring. Great quilts. I love the colours in the first one. I always buy yards of sale fabrics for my backs. I also buy light upholstery fabric for backs of children's quilts as that fabric takes a bit more punishment. Happy Thanksgiving! I love your colors and I can just imagine how cuddly that flannel quilt would be.We are having a beautiful fall day and Columbus Day here, south of the border. Happy Thanksgiving Sandra: You picked the perfect quilts to share with us today. 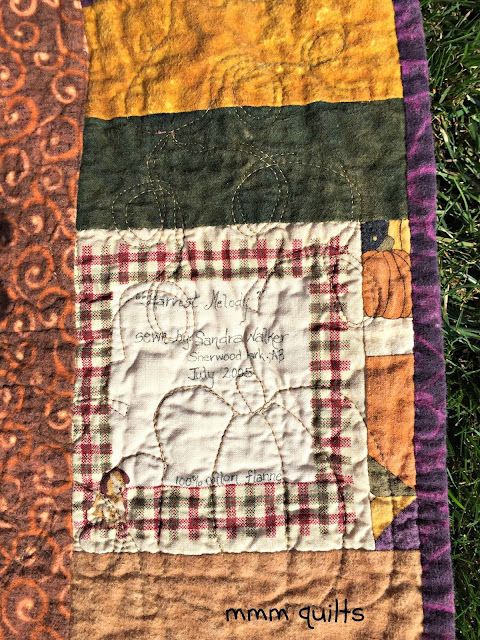 I love so much that you have holiday themed quilts to bring out seasonally. I am just so lazy about such things! That one is so soft looking, both in color choices and fabric. You reminded me that my parents' excellent friend, that has an old monastery in Nova Scotia (was called Nova Nada at one time, now Birchwood Lake) ,will be coming home to NY since Canada's Thanksgiving has happened. Blessings to you! LOVE these glimpses of fall!! It will arrive here some day ;) There is nothing better than seeing a quilt that shows signs of being loved! The quilt hanging by your door is awesome! Hope you had a lovely Thanksgiving holiday weekend. Thanks for sharing your fall quilts. It is nice to know that the all flannel quilt is holding up well. I have not made too many quilts with flannel. I think I used some in rag rug quilts. I am going to use a flannel sheet for batting in my cowboy quilt. 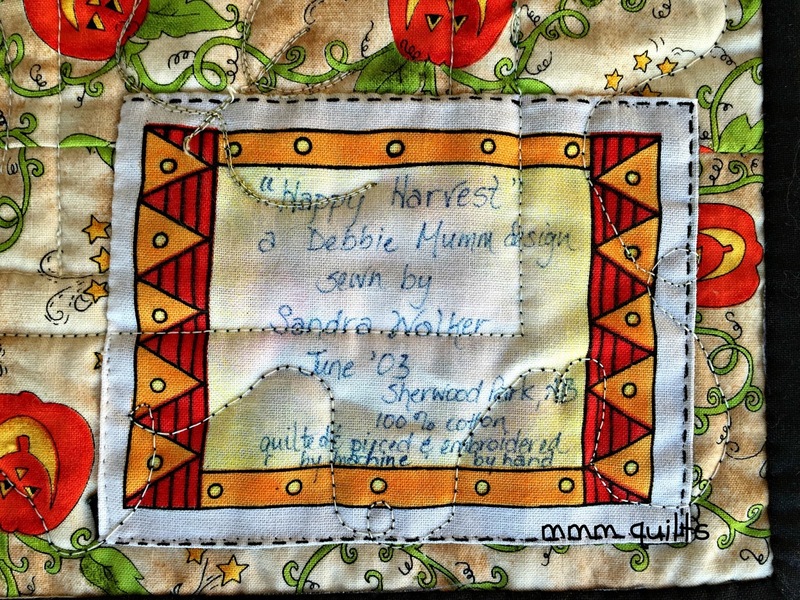 Some of my early quilts were Debbie Mumm designs. Happy belated Thanksgiving! I love the colors of fall. 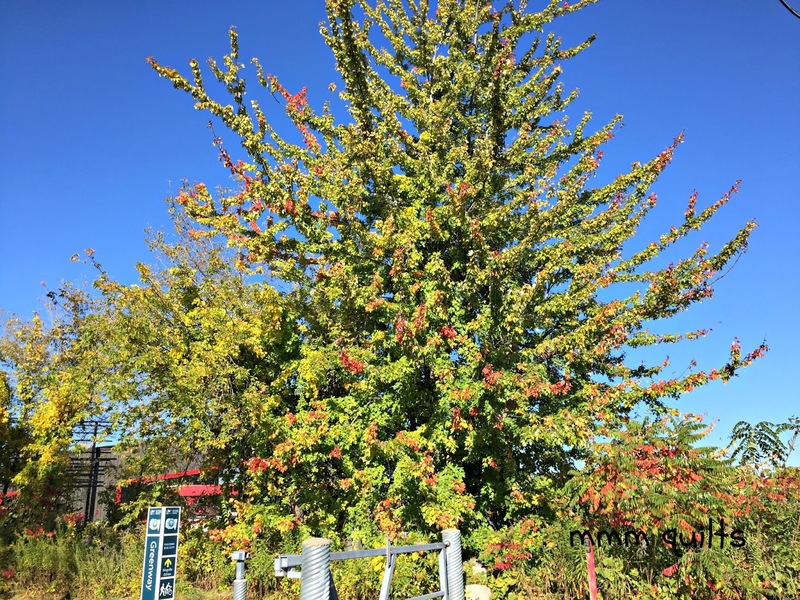 The leaves are starting to turn here and the earthy smells of fall are arriving. It makes me sooo happy!